Music From The Trials of Robin Marcato by ALONZO LEVISTER, reference cassette! 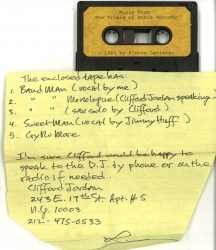 Unique reference cassette from composer/arranger/pianist Alonzo Levister for his dramatic work "The Trials of Robin Marcato." Levister, b. 1925, was prominently associated with Charles Mingus and Miles Davis, and has been active on the music scene since the late 1940s. Cassette features ths accompanying music to the play, and includes notes in the composers hand! Ensemble includes Clifford Jordan and Jimmy Huff. A one-of-a-kind piece of Jazz history.